“Today’s actions from CPSC are misguided and could jeopardize the safety of products in the future. CPSC’s guidance is not consistent with the state of the science and ignores CPSC Staff’s own science-based review as well as the regulatory determinations made by government authorities around the world. Equally important are the potential implications this guidance has for overall product safety as the guidance fails to fully consider critical issues around fire safety. In the last few years, there have been hundreds of recalls of consumer products based on fire hazards. “Fortunately, the guidance CPSC has issued is non-binding. We will actively communicate with the affected manufacturing sectors and businesses to clarify CPSC’s actions merely constitute a recommendation and that the guidance needs to be evaluated based on the state of the science and the need to fully consider all aspects of product safety, including fire safety. In September 2017, the Consumer Product Safety Commission (CPSC) published a guidance document that distorted the facts regarding additive, non-polymeric organohalogen flame retardants. 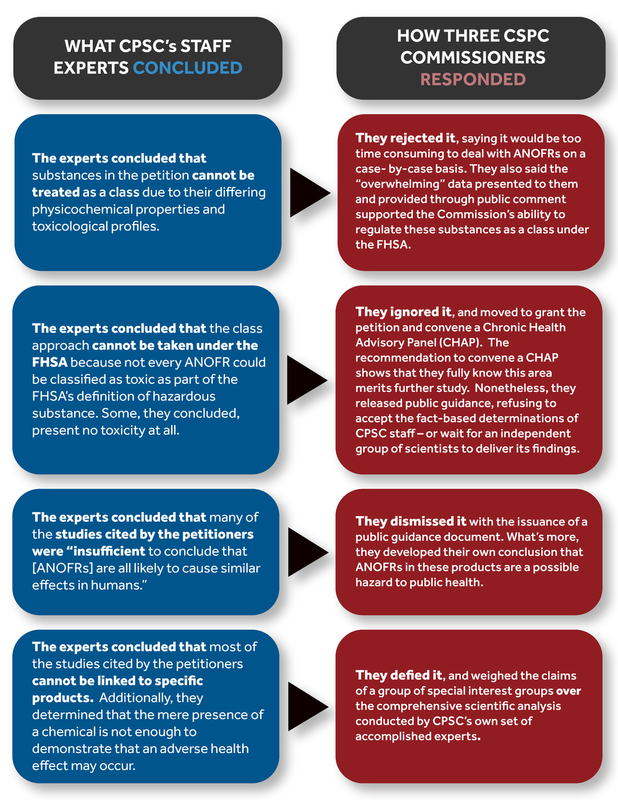 The document’s findings were based on a prior CPSC vote, where three commissioners dismissed the recommendations of their own technical experts — and opted instead to support the claims of a group of special interests that have long sought to remove these chemicals from the marketplace.